The set, which was the old Preventorio of the Child Jesus, consisted of two different buildings: the housing-detached house of Jose Batlles, built in 1927 and renovated in 1943, and the galleries and offices promoted in 1944 by the National Tuberculosis Board, linking the house with the limit Avenue Ntra. Sra. de Montserrat. Galleries, open to the garden, housed on the ground floor children’s bedroom, on the top floor and the girls. The villa, during the time it was part of preventorio, housed the management, administration and clinical care set. The building was closed in 1966. The whole left standing only the house of Jose Batlles, and is framed in the regionalist tradition from a project of Guillermo Langle Rubio. 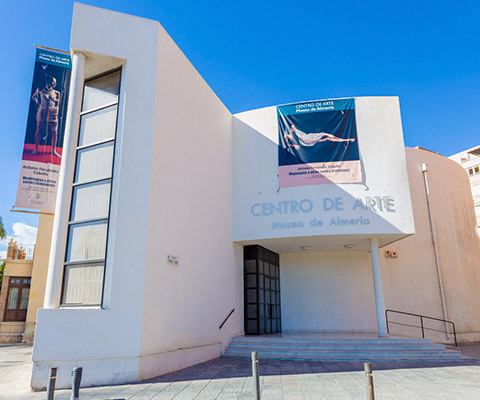 In an annex building he was added to house the Museum Art Center Almería, under the Department of Culture of the City of Almería, which opened in October 1998.